There's a reason why I stopped posting makeup related entries or anything that talks about beauty. I guess it's ok, to be honest with that fact that I haven't been taking good care of my skin in the past few years. It's not that I don't cleanse my face every night or leave makeup on my face overnight. It's just that, I guess, the adverse effect of testing too many skincare or makeup products of my face is taking its toll. As of the past year, my skin has become so sensitive that almost everything I put on my face breaks me out. And with that comes the insecurity of being ugly and the degrading feeling that I can never buy any beauty products that would work on me ever again. So, that's why decided to cut down on everything that I use on my face and be extremely aware of what ingredients go into my pores. Fortunately enough, I found out that Korean Sheet Masks, along with some my DIY Essential Oil Serum blends, actually helped to calm down my inflammation and the redness on my face. And that's where my Korean Skincare obsession started. I even came along the popular 10 Step Korean Skin Care Routine which surprised me overwhelmed me a lot! With that, I needed a source to buy quality Korean Skin Care Products that are ok for my budget and is low on shipping fees. I've heard a lot of good stuff about ph.althea.kr - or PH Althea Korea, so I decided to give it a try. Besides, they have a beauty box too, which offers you a handful of travel and full-size products on a discounted price. Here's my very first Althea Box purchase: Althea Box # 14 Green and Yellow Box. The infographics below shows the basic usage and active ingredients of each product in the box. I chose this because it has more skin care products than makeup in it and it was also recommended for oily skin. The prices here are estimates, based on the websites I got it from. It totals for Php 2,608.60. A couple of this products are not available in Althea anymore, but they priced this box as Php 4,093 if purchased individually. However, purchasing it via Althea I got it for only Php 1,360 or around $26 only. For me, buying products in a set or box form is really worth it! Skinfood Freshmade Pineapple Mask - I honestly haven't tried this one yet, thinking that I have to use up all of my active peeling gels first - since it says on the top lid that its a 'peeling gel'. Having no understanding of the Korean inscriptions on it, I did a little research about its usage and I found one blog that says this is not an 'active peeling gel' nor is it a 'wash off mask'. But, rather, it's a 'sleeping mask' that is filled with chemical exfoliants that are said to help with the skin cell's turnover as we sleep. Good thing I didn't slather it all over my face when I first got my hands on it. It's a pretty cool concept though, one that I'm excited to try! Petitefee Gold EGF Eye & Spot Patch - True to its word, this product has tiny gold flecks in it that feels luxurious when used under the eyes. Slight Eyebags and dark under eyes disappear after the first usage. VDL Correcting Primer in Green - My first usage, it looked alright. I guess I put just enough product to correct my redness, topped it with a cushion foundation and my face looked slightly whiter than my neck by the end of the day. I loved how it looks though, it gave my face a little glow that I didn't have before. My second usage, not yet aware that it is highly pigmented, I accidentally pumped a little too much and covered my whole face with it. My face looked whiter, which I thought would disappear if I add a layer of cushion foundation. Sadly, it just made it a lot worse. I tried to balance it out by applying bronzer on the side of my cheeks. In my room with minimal lighting, it looked ok but I went out my room with white cakey chin, which I only realized later on. Another thing I noticed was that I seem to break out with this primer on. My second usage gave my face those tiny butlig that I was dreading not to appear. So just be warned. 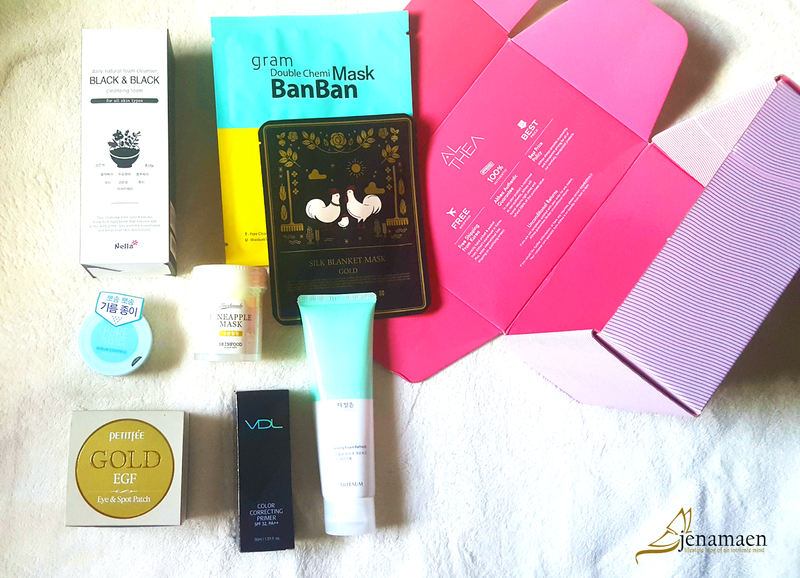 A'Pieu Gold Silk Blanket Mask (Single) - If you're new to sheet-masking, this one will intrigue you the most in this box. It's like gold sequins patched together to form the mask, drenched in rich, hydrating serum that makes the skin really soft after application. Aritaum Pore Master Sebum Control Powder - I vouch for this product! I've tried it several times and I never have break outs on this product. It does what it says - it mattifies the skin for hours and you only need to retouch once - at least on my oily skin type. Those are the products I've tried so far from this box. If you are interested in purchasing from Althea, here's a P200 off coupon code that you can use on your first purchase!